The nights are growing longer and it is time for ghostly tales of Hallowe'en. Cozy up with your favourite horror author of past or present, slip that familiar Universal or Hammer feature into the DVD player or schedule your life around TCMs spooky movie line-up. "He had a way with a yarn, did Mr. Irving." 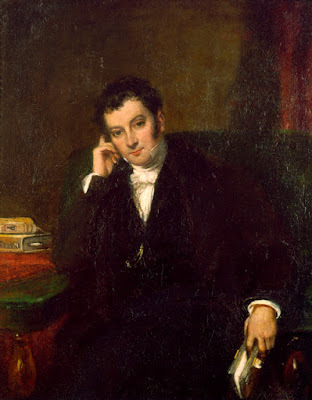 A perennial at this time of year is Washington Irving's The Legend of Sleepy Hollow written in 1820. 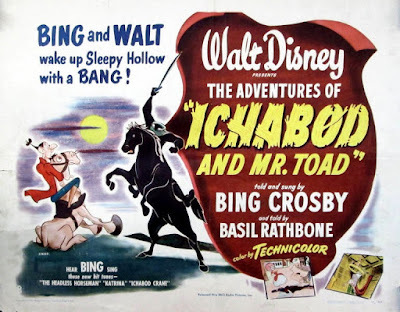 A grand tale told with verve and a cheeky sense of humour, both the chills and the chuckles translated beautifully to Disney's animated version originally released in 1949 as the second half of The Adventures of Ichabod and Mr. Toad. Since then, both stories have often been screened as separate shorts. 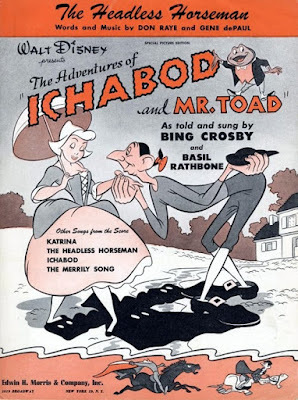 Basil Rathbone expertly narrated the studio's take on Kenneth Grahame's The Wind in the Willows, and Bing Crosby took up that mantle for The Legend of Sleepy Hollow. 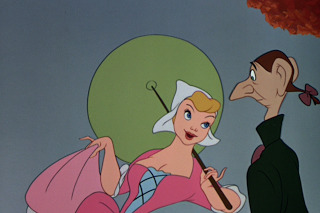 The writers of the witty adaptation were Erdman Penny (Cinderella), Joe Rinaldi (Sleeping Beauty) and Winston Hibler (Peter Pan). 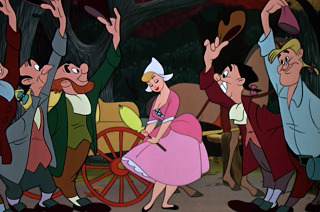 The animators included Frank Thomas, Ollie Johnston, Wolfgang Reitherman, Fred Moore, Ward Kimball and Milt Kahl. The directing team was Clyde Geronimi (101 Dalmations) and Jack Kinney (The Three Caballeros). The music was by Oscar winner Oliver Wallace (Dumbo). Bing Crosby as narrator both sings and speaks the story in the fluid manner so familiar to fans of his radio program, and his films. If Mr. Irving had "a way with a yarn", then Mr. Crosby had a way with language that pleases the senses. Vocalist and arranger Jud Conlon's Rhythmaires joined Bing Crosby's radio show in 1947 and their collaboration on this Disney feature is a prime example of voices combining in perfect musicality. The delightful songs are by Gene de Paul (Seven Brides for Seven Brothers) and Don Raye (Alice in Wonderland), and they humourously propel the story with a perfect platform for their narrator and companion to the artistry of the animators. Are they shovels or are they feet? 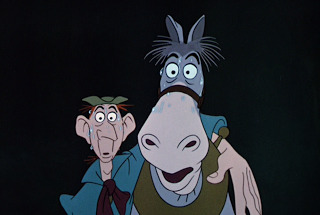 We are introduced to Ichabod Crane, itinerant schoolmaster, upon his arrival at Sleepy Hollow. 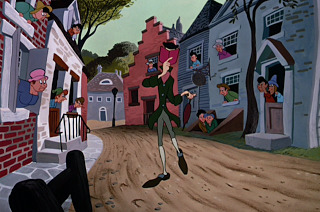 His arrival provoked both pleasure and consternation, but all agreed they'd never seen anyone like Ichabod Crane. We see the schoolmaster lording over his students, indulging his appetite at dinners and seeing to the cultural interests of the burg. 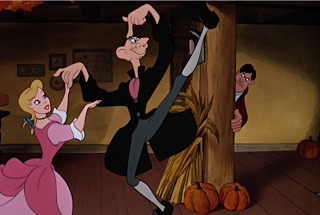 We also see that the unique Ichabod is victim to the pranks of local hero Brom Bones. None of this disturbs his remarkable equanimity, until the fateful day when his path was crossed by a woman. Ah, Katrina. The daughter of Baltus Van Tassel, the richest farmer in the country, was the local beauty as well as an heiress. All vied for her hand, but although it was obvious that she would end up with Brom Bones, Katrina often wished for a champion to take the field against the overly confident Brom. 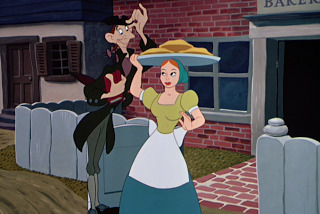 Such a man was Ichabod Crane who, in his obliviousness, felt that his charms far surpassed those of these country bumpkins. The annual Hallowe'en frolic hosted by Herr Von Tassel was an occasion where Ichabod triumphed with his Terpsichorean skill and charm. Brom Bones had one last chance to best and remove his rival for there was no more potent believer in spooks and goblins than Ichabod Crane. When guests were called upon to spin a ghoulish tale, Brom Bones stepped to the plate with the tale of the Headless Horseman. The comedy and the terror which combines in this scene is thrilling sensory overload for the small child and one which inspires sheer admiration in the adult viewer. Fortunately, I have found that the admiration gained as an adult film fan has not erased that original emotional response. It is so much fun to be frightened when no harm will come to you. Happy Hallowe'en, friends! I watched this film recently and I wasn't expecting that kind of ending. Disney was a little more daring in the 1940s - can you forget Fantasia? 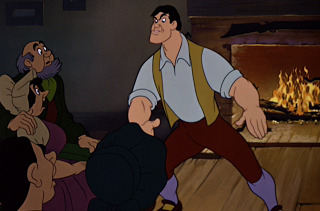 - and sometimes I miss this boldness in animation nowadays. I like your description of "bold". I think of this as a prime example of the Disney studio using all of the creative minds to their best advantage. I don't recall if I saw the MR. TOAD part, although I probably did, but the Headless Horseman part always scared the crap out of me. Mission accomplished! says the animation department. When I was a kid Ichabod's ride scared me more than the boogeymen in March of the Wooden Soldiers, and I was a year older and much more savvy (giggle, snort). Oh, I love this little film, Pat. I hadn't seen in years and then last year (I think) I saw it somewhere - probably online. 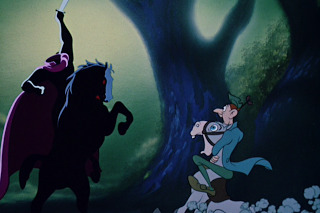 I LOVE the headless horseman characterization and also Ichabod Crane's horse. SO funny in his crazed expressions. All delightful and even scary - yep. I think it is a perfect example of what Disney, and what animation, can do at its best.